It is situated on the Black Dog Creek, and began as the Black Dog township. In 1845 a Black Dog Inn was opened near where the creek crossed the Melbourne-Sydney Road, and in 1851-52 a government surveyor mapped out a township on the creek. There are forest reserves encircling the township from the north-west to the south-east and it is possible that a local settler imagined a resemblance to the Chiltern Hills, England. In any event, during 1853-54 the name was changed to Chiltern, and township lots were sold in June 1854. In 1858 gold prospecting was carried out in the Indigo Creek area, north of Chiltern. By February 1859, a prospecting party was active in the valley in which Chiltern lies. Several rich leads in the direction of Chiltern were being worked by the end of the year. Following township land sales in 1861, Chiltern was proclaimed a municipal district (in effect, a borough) and a council was formed in 1862. 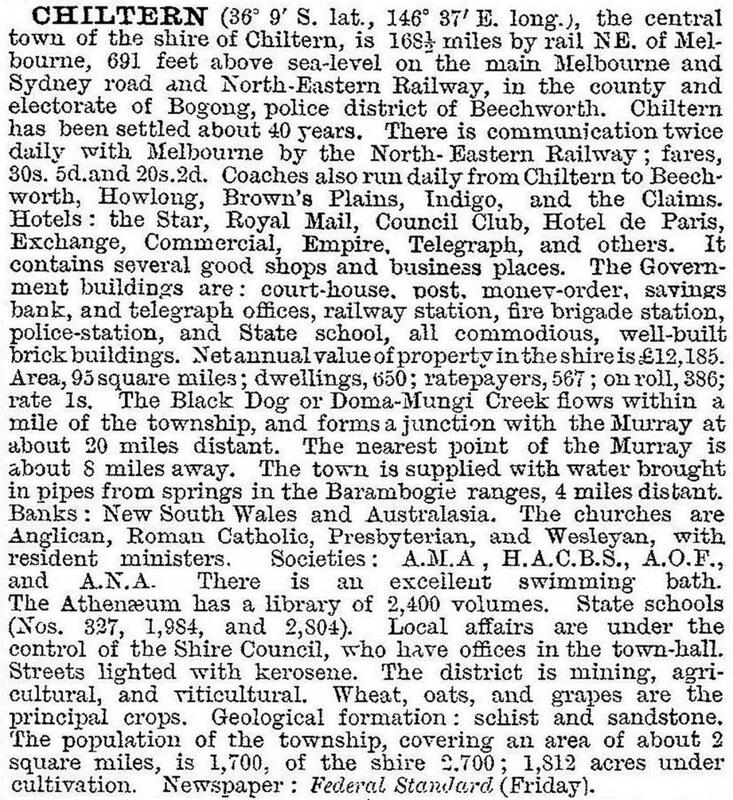 In 1859 when the Chiltern goldfields was known as New Ballarat a local newspaper began publication. Known as the Federal Standard, its printing office was built of locally made bricks in 1861-62, and it continued publishing until 1970. The building is one of seven in Chiltern on the Register of the National Estate. By the mid-1860s Chiltern had pastoral agricultural and mining activities, mining and police courts, an Athenaeum and literary institute, churches and schools conducted by the Anglicans, Catholics and Presbyterians, a Baptist Meeting House, friendly societies, banks and insurance agencies, and numerous hotels. Chiltern retains a great many of its gold-era buildings, comprising residences, shops, churches, banks and civic facilities. They make it particularly attractive for visitors, and the National Trust was active during the 1970s in preserving the newspaper office, Lakeview and a pharmacy which contains a comprehensive collection of nineteenth century fittings and equipment. The town has been used as a location for making several films. The Star Theatre and Grapevine Hotel (1866) form an extensive suite of registered buildings. The court house (1865), the Anglican and Uniting (former Presbyterian) churches (1875) and the railway station (1875) are also heritage-listed. Within a few kilometres westwards of Chiltern there were gold-era villages, including Durham, Cornishtown and Chiltern Valley. The box ironbark forests comprise a regional park of 4300 hectares north and east of Chiltern. They are a habitat for several rare bird and animal species (regent honeyeaters were released into the forest in 2010 and 2013), and contain ruins of the Magenta Mine, the Cyanide Dam and the Indigo Cemetery. 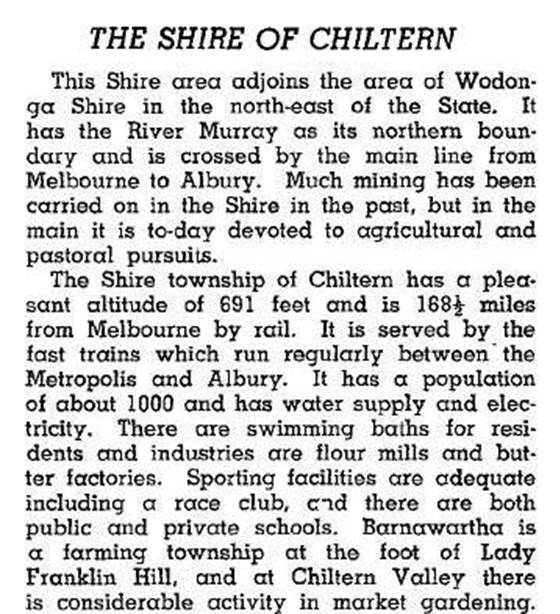 Since the 1970s when the growth of Albury and Wodonga was promoted, the population of the Chiltern township has grown. In addition to its own attractions, Chiltern is close to the Rutherglen wine region, the Murray River and the Hume Freeway. The shire's farming is mainly pastoral: in 1994 there were 13,000 meat cattle grazed and 34,000 sheep and lambs. About 55% of the shire's 502 square kilometres was farmed. Chiltern has a Catholic primary school (1913), a State primary school (79 pupils, 2014), Anglican, Catholic and Uniting churches, a caravan park, bowls and golf venues and a recreation reserve. On 18 November 1994, most of Chiltern Shire was united with Rutherglen Shire and most of Beechworth and Yackandandah Shires to form Indigo Shire. The balance of Chiltern Shire was added to Wodonga Rural City.